Community Outreach Team 2013 – Exciting Summer Work in St. Paul – Deadline May 8 was written on April 2, 2013 and filed in All, Inclusion, Issues Forums, Minnesota, Neighbor Neighbourhoods, News, St. Paul - US, US. 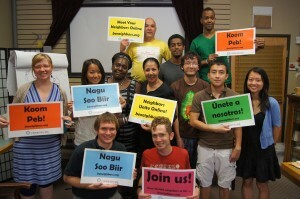 Join our 2013 “BeNeighbors” Community Outreach Team! – APPLY BY MAY 8! We are deepening our Knight grant-funded inclusion campaign to grow our St. Paul forums with the greatest diversity possible to over 10,000 members. We’re also planning fundraising to include Minneapolis and other communities in future years. If so, consider applying for one of 5 part-time, contract outreach positions. These new outreach staff will work both individually and with a team to recruit members for our neighborhood forums primarily among African-American, Southeast Asian, African immigrant, and Latino communities. Description: Work as part of a team to develop and carry out diverse community outreach. Tasks are likely to include tabling at community events and venues (including outdoor events in sometimes inclement weather), interacting with attendees and/or presenting at neighborhood meetings and events, door knocking and posting flyers, and conducting face-to-face, phone, and online recruitment. The team goal for the summer is to recruit 2,000 new members to the Saint Paul neighborhood forums by focusing efforts on our most highly diverse, low income neighborhoods. Imagine the possibilities for empowering all voices! Time Commitment: 12 weeks from late-May through mid-August 2013. Contractors will work 10-20 hours per week and must be flexible, reliable, and able to work mostly late afternoons, evenings, and weekends, sometimes with short notice. Proven ability to work as part of a team. Willing to pitch in to help others with day-to-day project tasks (event logistics, preparing/delivering materials, record-keeping, data entry, etc.). Excellent personal accountability and follow through. Can meet deadlines and manage multiple tasks in a fast-paced work environment; highly flexible and able to handle high-stress situations. Highly self motivated, self directed, and organized. How to apply: Send a cover letter describing your qualifications and how you heard about the position. Also, attach your resume with three references to team@e-democracy.org by Wednesday, May 8, 2013. We will make the final decision shortly thereafter. Use the subject line: Community Outreach Leader Application. Include any questions in your email. No calls please. For more information, about this effort, please our website, and click on both “Blog” and “About”. If you see this posting late, check here to see if the position is still open.